Warmly spiced Moroccan chickpea stew makes a satisfying meatless meal. Eating less meat is one of the best things that you can do for the environment. Going meatless, even one day a week is (environmentally speaking) like taking your car off the road for a few months. Want to save the world, and eat really well? 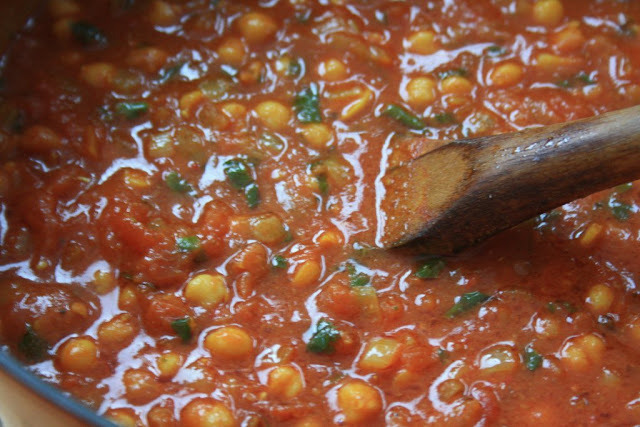 Get to know a few meatless dishes, like this Moroccan chickpea stew. It tastes even better the next day so make a big batch. Saute the onion and garlic in the oil until soft but not brown. Add the spices, stir for a minute or so. Add the roasted red peppers, tomatoes and broth. Simmer until thickened (30 minutes). Add the chickpeas, season with salt and pepper. Simmer gently to thicken and further develop flavour. Add the lemon juice and zest and cilantro. Serve with couscous tossed with toasted slivered almonds and preserved lemons.